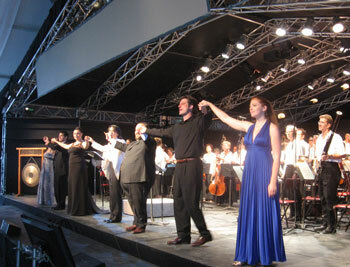 The organizers of Festival Bel Canto 2008 programmed a lot of music by the great bel canto composers – Rossini, Donizetti and Bellini – but only one full-length opera. And they chose well in the inaugural season; Bellini's Norma is generally regarded as perhaps the greatest of the genre. But Norma has always been problematic too in that it requires an exceptional artist to conquer the challenges of the title role. Callas, Sutherland and Gruberova have done it, but very few others in recent memory. Micaela Carosi accepted the challenge in Knowlton this past Sunday, in the closing performance of the festival, and acquitted herself admirably, as did the rest of the cast, conductor Kent Nagano and the Orchestre symphonique de Montréal (OSM). Vincenzo Bellini (1801-1835) is one of those composers – Mozart and Schubert are the prime examples – who died well before his time and accomplished extraordinary things during a short life. Bellini wrote very little instrumental music, preferring to compose operas. He is sometimes dismissed as "superficial." Musicians point to the simple harmonies and accompanying figures as evidence that he had nothing new or profound to say, but one could argue that Bellini's "simplicity" is often like Mozart's: with simple means both composers could portray great depth of feeling. The character Norma, for example, is one of the most complex personages in opera; she is a Druid leader dedicated to throwing off the yoke of the hated Romans and yet she has had two children by the Roman leader Pollione. When she discovers that Pollione has been having an affair with her fellow priestess Adalgisa, her sorrow and rage lead her to thoughts of kill ing her children, Pollione and Adalgisa. In the end she decides to sacrifice her own life. Wagner might have depicted all of Norma's varied emotions with distinct musical ideas, but like Mozart, Bellini proceeds with more subtlety. He never forgets that his medium is primarily vocal music and that vocal music can never be less than beautiful. Bellini's vocal lines are often florid and highly ornamented, thereby conveying extremes of emotion from the heights of joy to the depths of sadness. It is the measure of a bel canto performer how well he or she uses this ornamentation to convey emotion. For many singers the goal seems to be accuracy; this approach reduces Bellini's art to empty display. Yesterday afternoon Micaela Carosi treated the bel canto festival audience not only to a mastery of the notes but also to a clear understing of how the notes can be used to enhance expression. She has a large and beautiful voice and gave a convincing portrayal. Her performance of the famous "Casta diva" was both accurate and moving. As good as Carosi was, I felt others in the cast provided a greater range of emotion. Mezzo-soprano Kate Aldrich as Aldalgisa has an even more beautiful voice than Carosi and brought her character to life with much more intensity. Aldrich conveyed a great deal through facial expression and careful attention to rhythmic detail. Tenor Francisco Casanova was also in command of the technical requirements of Bellini's score and in the final scenes he captured the pain and agony of the situation with remarkable power. And he did it without resorting to the Italian tenor's usual tricks of holding high notes for effect or adding crude sobbing. With strong singing and a few well-chosen gestures he helped to make these scenes intensely poignant. Canadian bass-baritone John Relyea played the chief druid Oroveso, also Norma's father, and showed why he has rapidly risen to become a star at many of the world's great opera houses including the Met. While hardly old enough to be credible as Norma's father, he sang with strength and an uncommonly beautiful sound. Special credit must be given to Kent Nagano who masterminded the entire production. He set the tempi, adjusted the delicate balances between singers and orchestra and within the orchestra, and gave clear guidelines as to the style of singing and playing. In conversation onstage with the CBC's Kelly Rice before the performance Nagano commented on how much the orchestra had learned about bel canto style from being immersed in it for the past few weeks. Nagano pointed out how a recent Mendelssohn performance by the OSM sounded quite different, and appropriately so, from this concentrated work on the music of one period. But Nagano is that kind of conductor - very serious about his work and always curious about learning something new and better. Montreal is lucky to have his inquiring mind, not to mention his enormous conducting skill. Norma is full of recitatives which many conductors find either boring or impossible to sort out. Nagano gave clear and strong directions for every recitative passage; it may not mean much to the audience but I am sure the singers and the members of the OSM were very appreciative. The orchestra played superbly throughout the performance and the OSM Chorus was excellent too. Incidentally, there was a huge gong which sat on the left front of the stage throughout the performance but it was never used. In Act 2 Scene 7 Norma strikes a sacred gong three times to indicate that it is time to go to war against the Romans. In the Jürgen Rose production of Norma given in Munich in 2006 and issued recently on DVD, Norma (Edita Gruberova) is seen to strike a remarkably similar gong. What happened in Knowlton? We heard the three strokes on the gong but the strokes were delivered by the percussion section of the OSM. Why have the gong on stage if it is never going to be used? It reminded me of Chekhov's old maxim about a gun; if a pistol is seen on the wall in the first act one expects it to be fired later in the play or it shouldn't be there. At the Norma performance on Sunday, Honorary Chairman of the festival Marco Genoni announced that at next year's festival the featured opera will be Donizetti's La Fille du Regiment, sung in French.